When Nandini, young Hyangla's cow, strays inside Nakshi forest, he encounters the witch Jatai Buri. She initiates him into the world of magic. His education is completed by Master Rudra, the head of the Order of Good sorcerers. Soon he is flying around on his banyan leaf, curing sick villagers with magic. 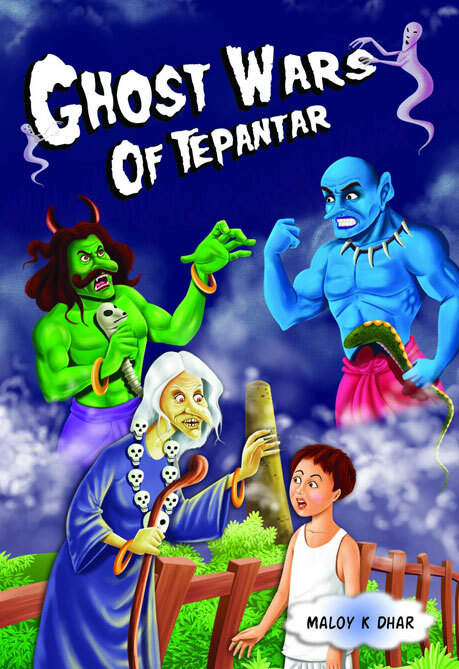 The story culminates in the ghost war of Tepantar—a war in the Tepantar marsh fought between Rudra and Rakshit (the master of evil sorcerers) with Kulapati, his evil commander. The author takes us on a see-saw ride through the fascinating world of ghosts and spirits. We are introduced to ghosts not only from India, but from other parts of the world. A political commentator and a strategic expert, Maloy Krishna Dhar was a highly decorated police and intelligence officer. After retirement he took to freelance journalism and authored many literary works including Open Secrets—India's Intelligence Unveiled; Fulcrum of Evil—ISI, CIS, Al Qaeda Nexus, Operation Triple X, Black Thunder, Shakti, We the People of India: A Story of Gangland Democracy and Battleground India: Prognosis of Hindu-Muslim Exclusivism. Ghost Wars of Tepantar is the last book of late Maloy Krishna Dhar, who passed away in May 2012. This book of fiction was written with great love as a gift for his grandson.